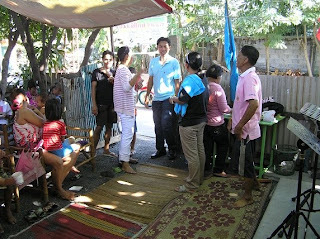 Follow the adventures of the Malones in Thailand as we work with urban and rural peoples in the Isaan area in Thailand. We aim to share the Good News of Jesus with the Isaan and mobilise for 5 teams across Isaan. Previously, we were with the poor in Samut Prakan (part of Greater Bangkok). If you would like to work with us (short or long-term) please don't hesitate to contact us for more information. As a follow up to the last 2 posts with videos on the unreached people of Isaan, I have posted below a video of a recent rip to 4 districts around the city of That Phanom - on the Mekong River in the province of Nakhon Phanom. All the districts we visited (around 250,000 people) have no believers or no churches. Please pray with us as you watch this video that the Lord of the Harvest will thrust out labourers into His Harvest Field. As a follow up to the last post with a video on the unreached people of Isaan, I have posted below a video of a recent rip to Kalasin where there is only 1 believer per 1,300 people and large tracts of towns with no believers. Please pray with us as you watch this video that the Lord of the Harvest will thrust out labourers into His Harvest Field. We have moved to Ubon Ratchathani, one of the largest cities in the Isaan Area of Thailand. Below is a promotional video (around 4 minutes) where we share of the need here for workers to join us in the task of church planting in one of the least reached areas of the world today. Please pray with us for workers in this harvest field. We have been working in this community for 4 years - started one year after our arrival into Thailand. By God's Grace, a community church has been planted in this place. 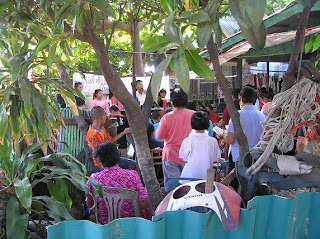 We are praying this gathering of believers grows to be a strong base from which many communities in Samut Prakan are reached. It will be up to the new leaders (Thai) to carry this work on as we prepare to leave for Isaan in a few months. Picture 1 shows the guys in the worship team practising before our time together last Sunday. The guy on the right has written his own songs (one of which is on the movie later in this blog) and has a heart for his community to see Jesus. The guy in Picture 2 has a servant heart that I rarely see in others. He is one of the leaders in this community church. He never lets me go thirsty! :-) Pray God continues to give him strength to serve and lead his community. Picture 3 shows two of the ladies that attend this community church. They live simple lives caring for their grandchildren. The lady in blue on the left has a growing hunger for the Word of God. Pray these ladies would be blessed and lead other ladies to the Saviour. There are much more men in this church than ladies! - quite unusual for Thai fellowships. Picture 4 shows where we meet for church - in the front of a member's house. A few months ago, we put up a roof to cover the area where we meet to keep us dry during the heavy downpours of Thailand's wet season. Picture 5 shows me with a friend whom I have journeyed with in this community for a few years now. He still has more problems "than you could poke a stick at", but he is slowly learning what it means to walk with Jesus. His faith is very fragile - he needs strength and a growing will to change his addictive lifestyle. He looks much older than he is, because addiction has not been kind to him. Please join us in praying for Khlong Da Nu. I am a plodder, which means I persist with something until I get it. I have been in Thailand for almost 5 years now (broken by a 7 month break in Australia - which probably means I have only had 4 and half years exposure here). Learning the Thai language has been a priority, but also one of the most degrading experiences in my life. At times, learning this language has put me in such a rut that it has driven me to depression, which almost made me give up on the Overseas Mission Field after the first year or two back in 2008-09. But God, by His abundant Grace, has allowed me to endure. Consequently, over the last year or two, God has given me the privilege of enjoying fruit of new believers and a new church plant. But this hasn't come without its many pains and intense struggles. By God's Grace, He has given me opportunities over the last 12 months to teach new believers in our slum church plant, which has extended my confidence in speaking Thai. My latest encouragement was on 27 May when I preached my first full sermon in Thai for 40 minutes at the main Thai church we hang with each Sunday morning. Note: this is not our slum church plant, which meets on Sunday afternoon. It is more of a traditional church, not the house church model (like in our local slum) we are seeking to obey God in building. Although it seems quite embarrassing, I have inserted a short 1 minute video that Jen took on that day of part of the sermon that I was preaching on about dealing with Temptation (from I Corinthians 10:13). I want this video to testify to the awesome Grace of God that has enabled me (probably the slowest and worst of all language learners) to now teach and preach in this immensely difficult language. YES, God can do anything (Ephesians 3:20,21)!! 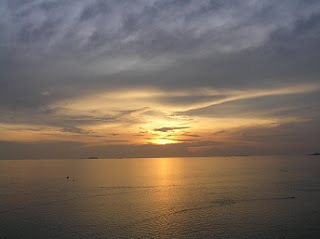 In preparing to come to Thailand in 2007, God gave me several personal promises if I were to obey Him and step ahead in faith. One of these was that He would give me the Thai language. He never promised this language to me in "5 minutes". NOTHING has ever come naturally to me in learning Thai, but 'bit by bit' He is giving it to me. I thank and praise God for His persistent hanging with me. Anything is possible through Him. No matter what stage we are at in life, we are travelling on a journey ... a journey that hopefully the Living God is directing us on. Life is short and uncertain, so it is wise to ensure our journey is God's best for us. We can discern God's best by listening to Him and seeking His Heart. In this we can be assured that He has awesome plans for us (Jeremiah 29:11-13). Our journey at this point in time has us training leaders in the new church plant in our local slum community. Like any journey it is quite challenging - trying to understand people's nuances when they speak which are often immersed in culture that is still 'foreign' to us. Also, there is challenge in knowing how best to train these humble people .... we definitely don't train in the same way we would in Australia. We need to fit into their culture and relate and serve them in the best way for them to understand. So, I ask you to "get on board" this journey with us by praying for wisdom, resilience and faithfulness on our part. We have been on the Leadership Development phase of this journey for at least 3-4 months already. Like the Thai family in Image 1 above, the journey has sometimes being a little uncomfortable as we try to fit together and meet their needs. It is our role to serve these new leaders who have only been followers of Christ for around 1-2 years. Please pray we remain faithful and obedient in this Leadership Development phase and that they continue to grow in caring for one another and reaching out to the communities around them. As we listen carefully to God we believe the next stage of our journey is taking us to the Isaan Region of North East Thailand, where around 22 million people live - most of whom have not heard about the Good News. God is preparing the way for this journey with many details being worked out before our very eyes - even before we ask for them! 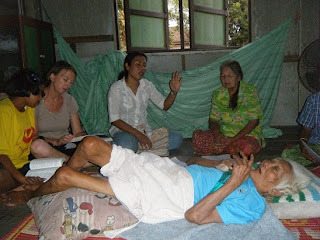 You have probably caught up with the fact that we are intending to move to the Isaan Region of North East Thailand by the end of this year to start a new team "Sowing Seed to Plant Indigenous Churches". Seed sowing is an important occupation in this large region of 21.5 million people. 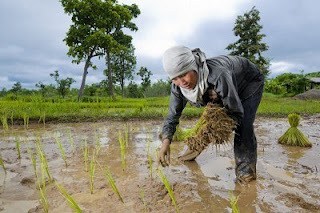 It is mainly poor rural communities that make up Isaan - main industry is agriculture, with the production of Sticky Rice accounting for 60 per cent of the cultivated land in Isaan. However, Isaan is the driest and poorest region in Thailand - all of Thailand's 10 poorest provinces are in Isaan (the poorest province is Si Saket, which is just to the west of Ubon). Isaan has a history of being dominated and oppressed by various regimes over the last 800 years - which paints a painful past for the ethnolinguistic groups that occupy the region (Isaan, Lao and Khmer). We are excited about the potential here for great things to happen and for building on the work already started by others in some parts of the region. 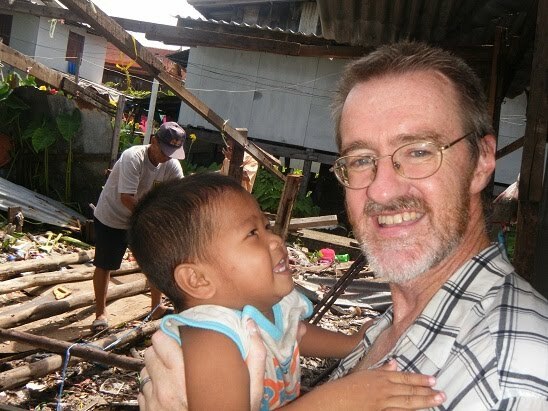 In early May we are making another survey trip to the Isaan and visiting with a Thai Christian worker in the needy province of Si Saket (poorest province in all of Thailand) to see how we can partner with him in the future. What is a picture of the need in Isaan? This data shows that in order to evangelise their respective provinces, each Christian in Chiang Rai only needs to reach 17 people, while each Christian in Kalasin needs to reach 1,303 people. Much God-honouring work has been done in the past in areas like Chiang Rai and Chiang Mai and we celebrate the progress of the Good News in those places. But these figures demonstrate the enormity of the missions task STILL to be done in the Isaan region and its true nature as a largely unreached area. My heart cries deeply as Jesus spoke about the harvest being plentiful but the labourers are few. This truly reflects large sections of Thailand, with a heavy focus on the 20 provinces that make up the Isaan region. Will you pray with us as we seek to build a team strategy, survey and build a plan of action over the coming months to reach the great unreached region of Isaan in North East Thailand. Please pray that seed would be sown in relationship building that lasts for eternity to give people an opportunity to hear the Good News about Jesus. 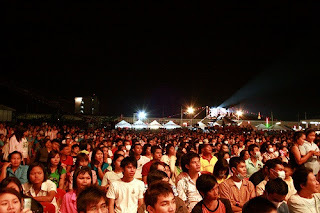 Yes, we are planning a move from Samut Prakan to another part of Thailand by the end of this year - to do similar ministry. After 3-4 years of sweat and tears, God blessed us with the official opening of our church plant in our local slum community (see photos after this 1st paragraph). This seemed impossible 7 years ago (end 2004) when we did the surveying and then even more impossible when we started the reality of working there 4 years ago in 2008. But God does more than we ask or imagine (Ephesians 3:20,21 - my life favourite verse). During that time we have seen God bring people to Himself in a new faith, and taken us through some incredibly difficult times, given us strength through discouragement, gave us the opportunity to train a team of Thai leaders and now He gives birth (officially) to this new church! We are hanging around for a few more months yet, until we are sure they are fully equipped to reach out to new slum communities in our city. God is faithful .... as a quote from my autobiography says "Never doubt His faithfulness and His character to do more than what you can ask or imagine. Believe in the impossible and what mankind says is unattainable until, through God’s strength, it becomes possible and attainable." Moving on doesn't mean abandoning an area or ministry (i.e. the urban poor) .... it means giving it freedom to 'fly on its own' - in a similar way that God called us to do with our children when they became adults. 'Flying on your own' grows maturity and dependence on God like nothing else - we've seen that with our own children. Now we hope to see it with this new church plant. God has convicted me strongly in this country (and taught me through some very hard lessons) to be careful to hand things over to local believers (when the time is right) and remove myself from the temptation of squashing their initiative with my control tendencies. I have observed Jesus' example and Paul's example of an incarnational approach to ministry. But they never stayed in a place for very long. In Jesus short time of ministry He lived in at least 3 different places (Bethlehem, Egypt and Nazareth). In His ministry He travelled extensively to many places - moving on when He sensed the time was right! Paul, while being very incarnational, only planted himself in any location for up to 2 years (his longest was in Corinth for 2 years). I firmly believe I see the best fruit when God uses me (only by His Grace for an deserving sinner like me) to pioneer a new work where people haven't heard about Jesus, see God bring them to Himself and then grow them into a new church. What comes next is incredibly hard for me - MOVE ON !! God is now telling me to do just that. He is also telling me to maintain an apostolic connection for the rest of my life with the slum ministry in Samut Prakan. He is now telling me to follow His path to work in reaching the great unreached region of Isaan. I choose to obey my God - in tears I choose to move on .... watch this space over the coming months as we share more of the vision to reach the 21.5 million Isaan people group of North East Thailand - where the poorest of the poor live in this country. As the window draws closer to a close on 2011, I reflect on a challenging year while I enjoy a season of blessing at this time. 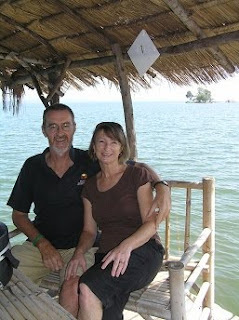 The year began with our return to Thailand for our 2nd term of service, after a wonderful furlough time in Australia. On the flight over as I listened to God, He said to me we would experience change, challenges and new things in this term. That has certainly being the case! After working 'flat out like a lizard drinking' to get paperwork in for our new work permit, visa and Samut Prakan branch office of our Foundation, God directed us back to live in the same neighbourhood which we had left 6 months beforehand. We praised God to see that the new believers (in our local slum community) from earlier last year were still following Jesus and growing. We marveled at the Grace of God in then bringing more people to follow Jesus , together with His abundant provision for our needs. I 'hit a wall' with the contraction of Dengue Fever in early May, which put me out of the action for at least one month. As I lay everyday in my bed, too exhausted to even walk down the stairs I reflected on the Grace and Sovereignty of God for me - that this ministry is not about what I do, but it is about HOW God works in His timing and for His Glory. As I cried for release from the intense back and stomach pains and begged God to take me either back to Australia or to Heaven, His quiet still voice spoke and reminded me why He had called me here to Thailand. I remained depressed, however, for a few months. Work in our larger slum community also 'hit a wall' and we even toyed with the idea of throwing the work in this community away. I was tired and depressed, not only from Dengue Fever but from the heat and humidity and the fresh new discouragements in the ministry. After complaining to God He challenged me to 'run with the horses' in much the same way as He challenged Jeremiah in Jeremiah 12:5. God then showed me to persist by still providing encouragement for us in the fruit from our local slum community (different community from the larger discouraging community mentioned above). He also used an overseas friend on Facebook (whom I have never met face to face to encourage me with these words "I know you long to be full speed. I also know Isaiah 40:31 is woven tightly into the fabric of your soul" .... God was calling me to rest and retreat more in Him. I began to feel the worst of Dengue was now behind me. God took me into a retreat period when I spent a few weeks seeking His Face on future direction in my life and ministry - first at a leadership training retreat and then on a personal retreat in the lead-up to my 50th birthday. During this time I also completed my autobiography "Saved from the Fowler's Snare", which I am praying about releasing next year. God produced more fruit in the ministry and started to consolidate the house church plant in our local slum community to provide encouragement for our souls. God poured His blessing out by gifting me with my first grandchild (a son to Karis and Noom) - 6 days before my 50th birthday! 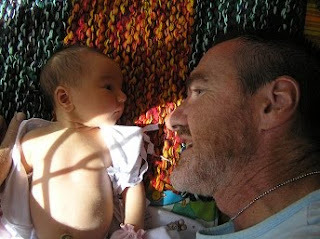 This fulfilled a promise God gave me at the age of 18 years old, that I would be a grandparent before I reached 50 years. 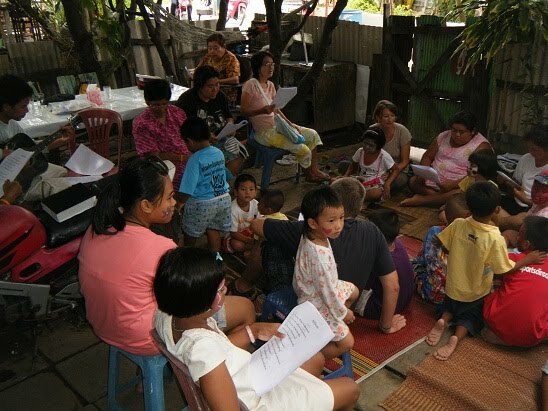 God also spoke clearly into the ministry with a new direction of discipling and training the emerging group of new Thai believers with our vision to reach all Slum Communities in Samut Prakan with the Good News. Again, we saw more new fruit as God brought people to Himself. Despite the immense challenges training new leaders was presenting, God began clearly leading in this way! 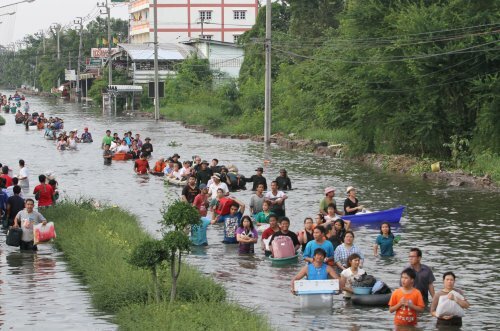 Despite the horrific damage caused by the Great Flood of 2011, God used this occasion to bless the Thai church by giving them an opportunity to be the 'hands and feet of Jesus'. We were very blessed by the generosity from friends back in Australia to our Flood Relief Fund. One of the greatest blessings of all was the opportunity God has now given for Jen and I to have all our kids in the same country for 2 and a half weeks. Tim arrives today (12 December). We have been blessed thoroughly to have Matt with us since early November. We then plan to travel with our sons to Ubon to be with Karis and Noom and our grandson (Eliyah Sartugan), as we share the first family Christmas together for 3 years. The New Year 2012 - ? 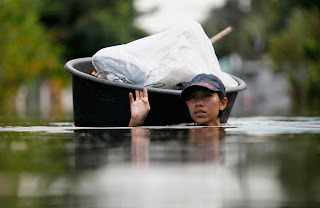 Most of you would be aware that Thailand has been coping one of its worst natural disasters over the last month or two - as massive amounts of floodwater flow through the country from the north to the mouth of the Chao Phraya River. On its way south the floodwaters have caused over 500 deaths, destroyed innumerable amounts of infrastruture (including many industrial parks and highways) and led to homelessness for millions of people. It has also wiped out a quarter of Thailand's rice crop - Thailand is the world's largest exporter of rice. Much of the floodwaters have now escaped to the ocean, but there is still more water to work its way through Bangkok, which remains under 1 metre or so of water in many parts. 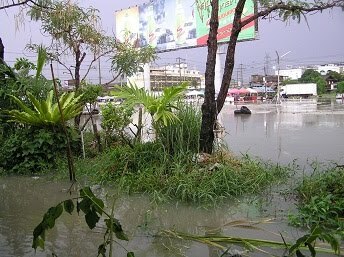 Our province - Samut Prakan - has largely been spared damage from these floodwaters, although parts of our province are now becoming flooded. Samut Prakan is the last province the flood passes through before spilling into the ocean. We are immediately south of Bangkok and at the mouth of the Chao Phraya River. 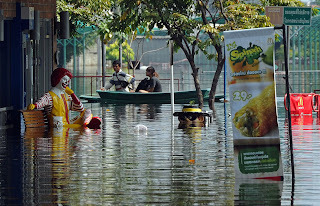 That is to our advantage - at least the floodwaters had somewhere to escape (i.e. into the ocean). Below are some images of the flood in Thailand. I stress that none of these pictures are my own, I have merely taken some off the Internet. 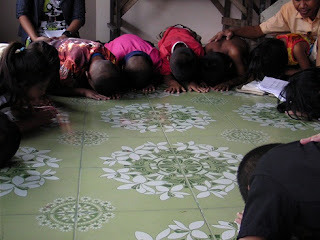 After viewing the pictures, could you please note the prayer points at the end of this blog and take a few moments to PRAY for THAILAND! 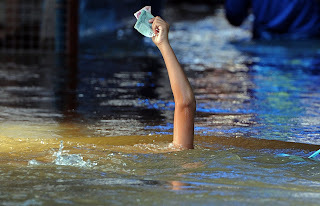 as floodwaters gradually abate that water-borne diseases would be controlled (note: there are already reports of people in the Central Plains suffering from water borne diseases).